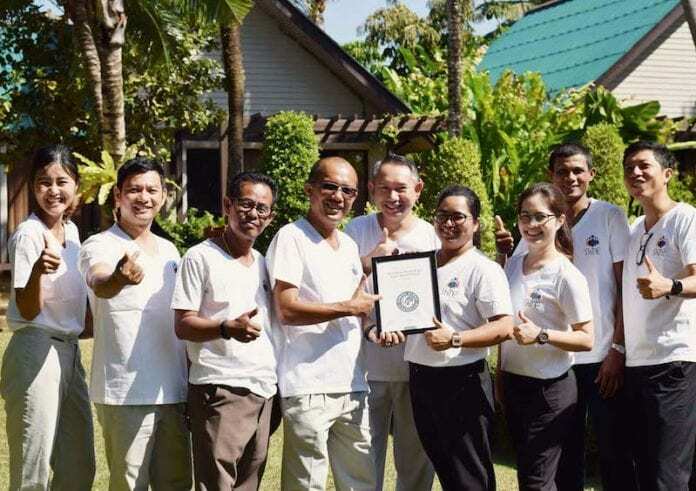 The 5-star Mövenpick Resort & Spa Karon Beach, a holiday beach resort in Phuket has been re-certified by Green Globe for the seventh year in a row and has achieved an outstanding compliance score of 86%. Regarded as a pioneering hotel for sustainable tourism in Phuket, the Mövenpick Resort & Spa Karon Beach has been active in social and cultural sustainability, as well as ecologically friendly practices. Sustainable operations implemented at this property include an effective pollution prevention program, water consumption reduction and energy-efficient lighting system. The Phuket resort also recently launched its ‘Orchid Garden,’ an on-going project which aims not only to beautify the resort grounds but also help preserve and propagate several species of Thai native orchids. An eco-focused initiative is in the pipeline as well, with the re-introduction of its ‘Organic Vegetable Garden and Plant Nursery’ where guests will have the chance to know more about organic planting and the ‘farm-to-table’ concept. The organic garden and nursery will host an array of vegetables and herbs including parsley, chili, eggplant, Thai basil, lemongrass and pandan. This project will also excite food lovers who are looking for a remarkable culinary experience. Once launched, guests may sign up for a Thai cooking class held in the organic garden, which will provide them with plenty of opportunities on picking their own herbs and spices needed for the cooking adventure. The Mövenpick Resort & Spa Karon Beach is one of the leading eco-friendly sustainable hotels in Phuket, situated just steps away from the pristine sands of Karon Beach. The property features luxurious guestrooms and suites surrounded by lush tropical gardens, four swimming pools, a kid’s club, seven restaurants & bars, a world-class spa, a fully-equipped fitness center, as well as upscale meeting rooms perfect for private events and conferences. Mövenpick Hotels & Resorts, an international upscale hotel management company with over 16,000 staff members, is represented in 24 countries with 83 hotels, resorts and Nile cruisers currently in operation. Around 20 properties are planned or under construction, including those in Chiang Mai (Thailand), Bali (Indonesia) and Marrakech (Morocco). Focusing on expanding within its core markets of Europe, Africa, the Middle East and Asia, Mövenpick Hotels & Resorts specialises in business and conference hotels, as well as holiday resorts, all reflecting a sense of place and respect for their local communities. Of Swiss heritage and with headquarters in central Switzerland (Baar), Mövenpick Hotels & Resorts is passionate about delivering premium service and culinary enjoyment – all with a personal touch. Committed to supporting sustainable environments, Mövenpick Hotels & Resorts has become the most Green Globe-certified hotel company in the world. For more information, please visit movenpick.com. Green Globe is the worldwide sustainability system based on internationally accepted criteria for sustainable operation and management of travel and tourism businesses. Operating under a worldwide license, Green Globe is based in California, USA and is represented in over 83 countries. Green Globe is an Affiliate Member of the United Nations World Tourism Organization (UNWTO). For information, please visit greenglobe.com. SHANGHAI, China - The highly-anticipated 29th China Wedding Expo (CIWE) will be held from February 23 to 26, 2016 at the Shanghai New International Expo Centre in Shanghai, China.